Oxxford personnel offer the information industry the most comprehensive technical support available. Over 90 years of combined experience in advanced mathematical model development and computer analytic software allow Oxxford client's unparalleled confidence in the systems and intelligence files created by Oxxford and used by the client every day. Risk analysis, from the ground up! Oxxford can identify and segment over 22 million businesses and over 200 million residential locations with both financial and environmental risk indicators. Only people grow business. Only excellence keeps it. Gaining a client's confidence over the long term is the result of performance, of service, and of offering a superior product . . . ultimately of working together. Everyone at Oxxford takes these beliefs seriously and our mission statement is in our everyday performance:"To deliver consistently high quality in all the services we provide in an innovative and functional manner. To develop and maintain positive, long term relationships with our clients." --To render the highest standards in professionalism and integrity in our industry." "Future Risk" variable for every business in the U.S. is now available. Email smonseu@ucis.com for detailed overview and information. Why rely on only one credit Score when looking at a critical Business relationship? 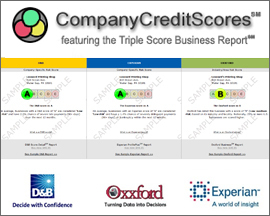 Shed light on your investment by accessing 3 scores from the top credit analytics companies joined together in one report!